We have lots going on around the farm. The flood put a damper on our progress and we have been having to deal with cleaning up piles and piles of river rock. We did get the rock off our main pasture fence and stood it up straight again. The rock is still all around us..but at least the fence is functional again. We are still trying to come up with creative solutions for the tons and tons of river rock on our property. The cows are quickly growing and gaining, the sheep are expanding and growing too. Several of our hens hatched out baby chicks and our baby pigs are also growing and causing all kinds of problems! We are also expanding our pasture area by clear cutting some of our wooded areas. We currently only have a small amount of pasture land and are needing more pasture to rotate the cows and sheep. We are also wanting to plant a sizable orchard once we get a section of the land prepared, so we are utilizing the land we have by changing it up a bit. I am sure we will share more on this at a later date. Our garden has been slow this year. We have had several invasions by the cows and piglets. I’ve also had plants mysteriously die and my cucumbers have been very bitter this year? I read that it could be caused from too much heat and irregular watering? So far, the okra and tomatoes are doing great. The peppers are just now starting to take off. I’ve learned that I don’t make a good gardener at 8 months pregnant! I’ve been working on putting up food in my pantry and freezer. I bought a ton of food from the local produce auction and have been working on getting all of it frozen and canned up! 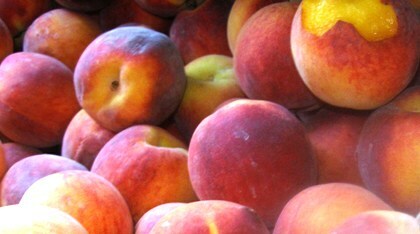 I also have lots of peaches that I am canning. I used to follow you a year or so ago, then I “lost” you when we changed computers. We aren’t on our farm yet, but love reading your experiances and can’t wait to become farmers ourselves!! Lord willing, next spring! Glad to have found you again. PS I don’t make a very good pregnant gardener either!